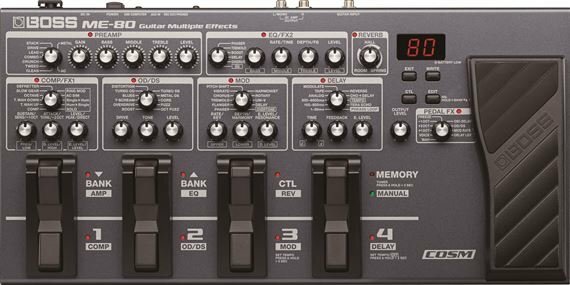 Shop Boss ME80 Guitar Multieffects Pedal from AMS with 0% Interest Payment Plans and Free Shipping. Mobile, battery powered, and filled with a diverse selection of flagship-quality Boss amps and effects, the ME-80 is the ideal compact tone processor for performing guitarists. A knob-based interface makes it simple to dial in great sounds in seconds, while easily selectable operation modes offer the flexibility of individual stompbox-style on/off or instant recall of multi-effects setups. Unique footswitches deliver twice the control of previous designs for efficient and intuitive effects switching, patch selection, and sound shaping while playing on stage. The free Boss Tone Studio software unlocks even more tonal possibilities, providing a cool graphical interface for tweaking and organizing sounds on your computer, plus a web connection to Boss Tone Central for direct access to free gig-ready patches created by top pro guitarists and much more. A complete history of gig-ready Boss tone processing is at your command, from multiple overdrives and distortions to wahs, mod effects, pitch shifters, delays, and beyond. 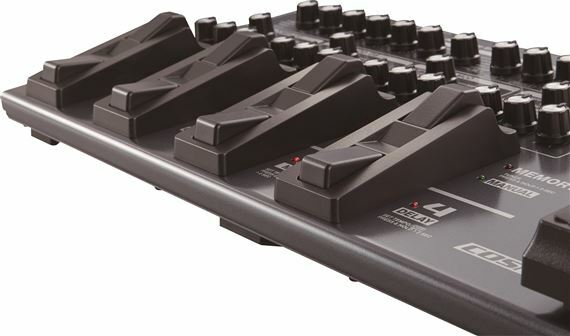 Boss’ groundbreaking Multi Dimensional Processing (MDP) technology is represented with the unique, spacious ambience of Tera Echo and the distinctive tone-shaping possibilities of Overtone. Updated COSM preamps include new additions such as Crunch and Metal, plus an AC preamp designed for acoustic/electric guitar. The onboard expression pedal can be used for foot volume and pedal effects like wah, octave shift, and Freeze, and it’s also possible to control effects parameters such as mod rate, delay oscillation, and more for expressive real-time sound shaping. Using the ME-80 is as easy as using a stompbox. Effects are organized into eight logical categories that can all be active at the same time. Seven categories contain multiple effects types to choose from, plus dedicated knobs for selecting a type and adjusting it with a set of parameters you’d find in the pedal version of the effect. The Pedal FX category has its own knob for quickly assigning a particular effects type or function to be controlled by foot with the expression pedal. With this familiar and friendly interface, you’re able to dial up and play great tones instantly, just like using a large pedalboard filled with your favorite stomps. But a major advantage over that pedalboard is that you can to save all the current knob settings to one of the ME-80’s 36 user patch locations, allowing you to recall custom effects configurations at the touch of a pedal. The hands-on experience that stompbox control provides is perfect for tweaking tones as you go. However, there are times when switching among an entire group of preset effects is more efficient, such as when you’ve set up complex tones for different songs. The flexible ME-80 supports either approach, giving you the best of worlds. In Manual mode, the categories function like individual stomp effects, with instant adjustment via the panel knobs and on/off control with dedicated footswitches. By entering Memory mode, seven footswitches are automatically reconfigured to select user or preset patches and patch banks, letting you recall complete multi-effects setups directly. One footswitch on the ME-80 is dedicated just for mode switching, so you can toggle between Manual and Memory modes any time you want, even in the middle of a song. 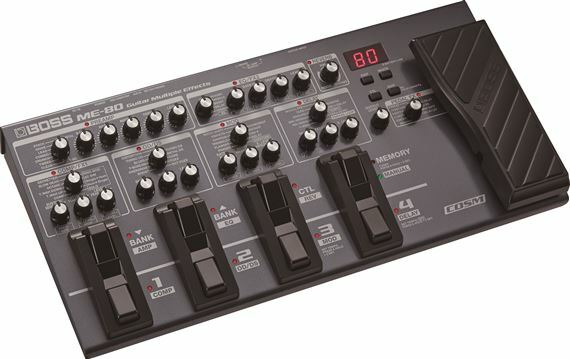 The ME-80 offers easy usability while performing, with eight multifunction footswitches for direct control of effects on/off, bank/patch selection, and mode switching, plus convenient access to alternate functions such as tap tempo, tuner, looper control, and more. A special control (CTL) function is also assignable in each patch, letting you toggle grouped effects on/off or adjust a specified parameter in real time. 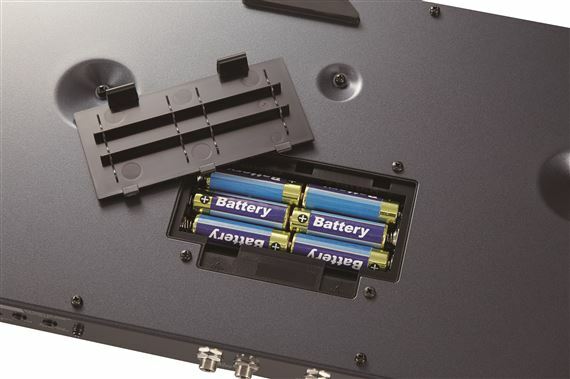 The newly developed footswitch style provides two switches in the space occupied by one in previous designs, allowing BOSS to equip the ME-80 with a generous array of foot-operated controls while keeping the unit extremely compact and mobile. In addition to the eight main footswitches, the expression pedal is equipped with an integrated toe switch that toggles between foot volume and the current Pedal FX setting. Via USB, you can connect to your computer and capture the output of the ME-80 directly into your favorite DAW to record pro tones with COSM preamps and effects. It’s also possible to monitor the ME-80’s effects sound while recording an unprocessed signal into a DAW track; after the fact, use the USB Loopback function to re-amp the dry track with the ME-80, tweaking the knobs as you listen to the song to capture the perfect tone. 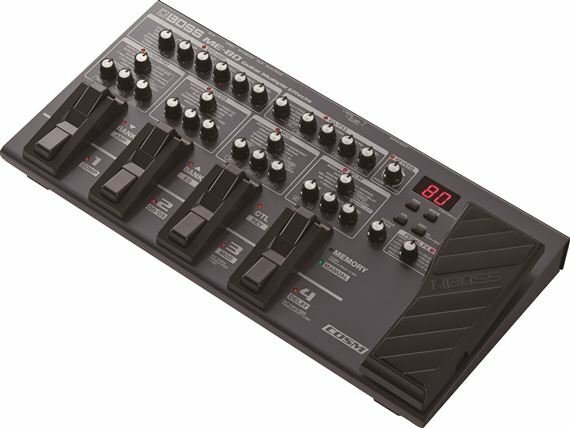 MIDI transfer over USB is also supported, allowing you to select ME-80 patches from your computer, send expression and control pedal data into your software, and swap patches via Boss Tone Studio. Available as a free download, the Boss Tone Studio application provides an inviting graphical interface for tweaking the ME-80’s effects from your Mac or Windows computer through USB. The software makes it easy to save, edit, and organize your patches, and to load them into the ME-80 as needed for different gigs and other applications. If your computer has Internet access, Boss Tone Studio also provides an integrated connection to the Boss Tone Studio website, allowing you to preview and download gig-ready patches created by top guitar pros directly into your ME-80! In addition to expanding your palette of tones, these free patches provide solid foundations for creating your own patches with the ME-80’s extensive array of effects. Boss Tone Central is the ultimate destination for all players that use BOSS guitar and bass gear. The initial focus of this powerful new web portal is on the ME-80, but compact stomps and other BOSS multi-effects will be included as the site grows. Right now, you have access to lots of great ME-80 content, including demo videos and free patches created by famous guitarists, touring pros, and session players. Check back often for additional patches, how-to videos, artist interviews, and much more. I’m new too the whole pedal thing so having multiple to play with and experiment was fun. Best bang for your buck. I purchased the ME 80 to replace the 7 pedals that I currently use. I was floored by the effect combinations that I could even imagine. It is easy to use and has terrific sounds. Even I can sound like a pro. I am going to sell or give away my old pedals and just use the ME 80. Buy this pedal! Its 100 amps in a pedal.it has everthing. I bought the Boss ME-80 about a month ago, and I'm currently gigging with it now. This board is unbelievable! It has more options than I will ever use, the pre-amp and EQ feature....along with many other sound options, from Tape Delay, Reverb....to Heavy metal fuzz, to California 60s cleans. I bought this board in the first place so I could play it with my 1963 straight tube amp with only volume and Tremelo so I could fine tune the the sound! It delivers sparkling cleans, and screams on crunchy solos.....or use the multi function pedal that varies from 2 different Octave options, Wah,, Expression, and much more than I can mention.....If you don't want to spend a lot of time and money putting a pedalboard together....than this is your best bet. So portable and easy for travel also! Thank you AMS!! It's well worth the money. Also save you money. The ME-80 is a great investment. With it you can play every type of guitar.Gospel, Blues, Rock, Metal you name it. The best part about it. You custome each tone as you like. or, download other player tones. (Awesome) Effect Board. This pedal takes the place of soooo many individual pedals Just grab and go, even having to have a great amp is no problem, this thing makes you sound good through anything you plug it into. Great investment!! !